Rest easy at this newly remodeled property. Stay productive at the on-site business center and keep connected with free WiFi. Squeeze in a workout at the fitness center and relax in a comfortable, non-smoking room. Each guest room includes a flat-screen HDTV with cable, microwave, mini-refrigerator, coffee maker, desk, and ironing amenities. Free guest parking. Conveniently located near Cheraw State Park and all local attractions. Follow us on FaceBook. 50 Rooms. Smoking/Non-Smoking. Pool, exercise room; cable, refrigerator and microwave in all rooms. Jacuzzi rooms, suites, group rates. Complementary continental breakfast area, restaurants nearby. 23 rooms. Smoking/Non-Smoking. All king and queen beds. Hair dryers, fax machine, full service restaurant and lounge, Jacuzzi, complimentary donuts and coffee. Free local calls. 80 rooms. Meeting and banquet space for 200. Large outdoor pool and recreation area. 40 rooms. Complimentary hospitality room for group bookings. Senior citizens discount. Close to downtown and restaurants. 12 rooms.“Friendly Hometown Motel." A family owned and operated motel offering clean rooms and friendly service 24 hours a day. Newly renovated rooms are available at daily and weekly rates. Amenities include microwaves and refrigerators in all rooms, high-speed Wi-Fi available, flat screen televisions with cable and security cameras. 190 newly renovated rooms, all with balconies. Full service hotel. Largest swimming pool on the block. Restaurant and lounge on-site. Amenities include free wireless high speed internet access, expanded cable, HBO, ESPN, Fox, free 24-hour business center with free copier and fax machine, interior corridors with elevators, exercise room with universal equipment and sauna, meeting and banquet rooms available, close proximity to shopping center. 71 rooms. Smoking/Non-Smoking. Pool. Small pets allowed. Handicapped rooms available. Complimentary boat battery hook-ups on site. 66 spacious guest rooms and suites. 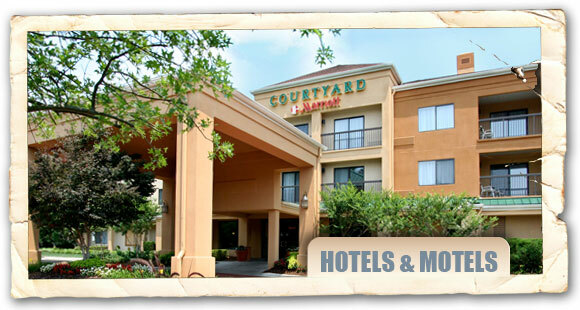 Complimentary continental breakfast, outdoor pool and whirlpool spa, exercise room and guest laundry. Suites equipped with TV and CD stereo players, large sitting areas and some with Jacuzzis. Complimentary high speed wireless internet access. 153 rooms with two meeting rooms and Jacuzzi suites available. All rooms have microwave/refrigerators, irons/ironing boards, hairdryer, coffeemakers, and free wireless Internet access. Complimentary deluxe continental breakfast, exercise room, and large outdoor pool. 71 rooms. 100% smoke-free. Located near numerous attractions, shopping, entertainment and sports venues in the area. Offers free full breakfast and coffee, free wireless high-speed Internet access, free weekday newspaper, free local calls, fitness center, indoor heated pool and indoor hot tub. Pets welcome. 43 rooms with suites (Jacuzzi suites available). Pool, exercise room and free continental plus breakfast, Charming bed and breakfast inn with modern conveniences and in-room amenities including coffee makers, microwave ovens and refrigerators. Two phone lines in each room with data ports, voice mail and fax hookups. Located in the all-new Kingsley Village, which features an amphitheater and over 150,000 square feet of boutique shopping and dining just steps from the hotel. Settle into one of our spacious modern guestrooms featuring luxurious bedding and 43” Smart TV’s with Netflix. The Bistro offers food, beverage and cocktail choices. Refresh in the heated indoor pool or re-energize in the well-equipped fitness center. 5,000 square feet of brilliant meeting space. Also conveniently located to area attractions. 40 guest rooms, Smoking/Non-Smoking, outdoor pool, meeting room, Jacuzzi. 47 rooms. Smoking/Non-Smoking. Pool. Complimentary continental breakfast. Senior citizens discount.